Becky Nelson of Bex Brands loves nothing more than finding a way to express a company’s philosophy, culture and approach visually. 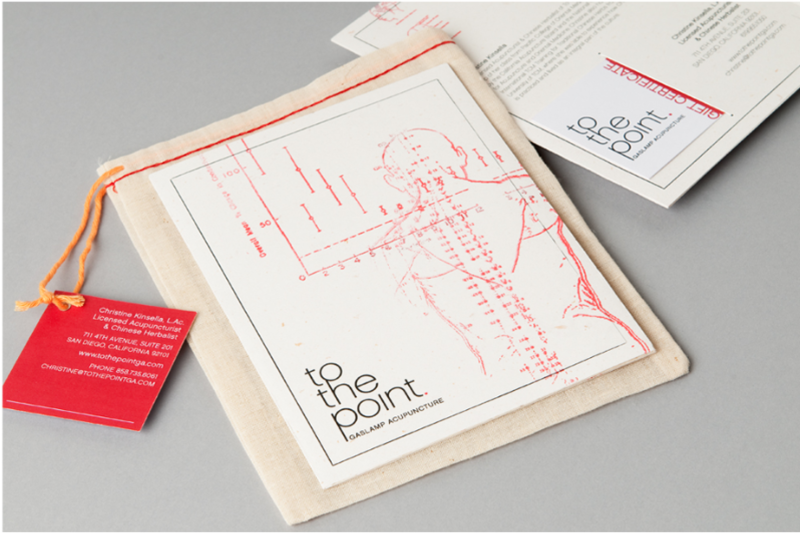 Her work with To the Point Acupuncture in San Diego was featured in our book. The brochure she designed for the acupuncture firm perfectly aligned with the company’s style: “I love that this project honestly and accurately expresses our client’s approach to acupuncture,” said Nelson. And you don’t have to have a large budget to afford good design, she explains. Many small business owners assume they’re stuck with clipart and DIY until they have big budgets for design, but it’s more affordable than they think. Working with To the Point, Bex Brands designed a brochure that could be reproduced in smaller batches to save on costs, and built it on a template that could be edited as the company grows. Making adaptations like this helps small businesses with small budgets who need to be flexible. Bex Brands has been working on projects for restaurants, which Nelson takes as a sign the economy is getting better. “We also participate every year in Chairs for Chair’ity, in which designers take chairs from a local furniture store and reinvent them to be auctioned to benefit Make A Wish Foundation San Diego,” said Nelson. Couldn’t agree more, Bec. Your work is always fantastic and spot on strategy regardless of the budget. Keep up the great work!